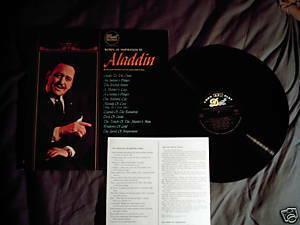 Dot DLP 3570 mono vinyl LP (1964) ALADDIN WORDS OF INSPIRATION - Most Requested Recitations From The Lawrence Welk TV Shows. MELODY OF LOVE / LEGEND OF THE RAINDROP / DECK OF CARDS / AN INDIAN'S PRAYER / THE TOUCH OF THE MASTER'S HAND / A COWBOY'S PRAYER / THE WINDOWS OF GOLD / A MOTHER'S LOVE / THE SPIRIT OF FORGIVENESS / THE CRADLE TO THE CROSS / ONE SOLITARY LIFE / I AM THE UNITED STATES. Record and cover are in excellent condition. Includes lyric sheet insert, although previous owner cut out one of the poems.